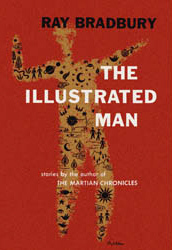 The Illustrated Man: Chapters Nineteen –Twenty-One - Jimmie Aaron Kepler, Ed.D. Literary expert William Stendahl has retreated to Mars to escape the book-burning dictates of the Moral Climate Monitors. On Mars he has built his image of the perfect haunted mansion, replicating the building from Edgar Allen Poe’s short story The Fall of the House of Usher, complete with mechanical creatures, creepy soundtracks and the extermination of all life in the surrounding area. When the Moral Climate Monitors come to visit, each of them is killed in a manner reminiscent of a different Poe story, culminating in the immurement of the lead inspector. When all of Stendahl’s persecutors are dead, the house sinks into the lake. When Charles Underhill was a boy, he was tormented by neighborhood bullies. When his son begins playing in a local playground, he becomes deeply disturbed when he sees a bully from his youth. An overweight carnival worker is given a second chance as a Tattooed Man, and visits a strange woman who applies skin illustrations over his entire body. She covers two special areas, claiming they will show the future. When the first is revealed, it’s an illustration of the man strangling his wife. Shortly after this comes to pass, the carnival workers run the man down, beat him, and look at the second area, which shows an illustration of the same beating they are doing. Next: Next post: Writer’s Life: Keep Writing and Submitting!